Stainless steel housing is grade 304 for superior durability to withstand heavy industrial applications. Sealed indicator and keypad allows the Weight Indicator Adam AE 401 to be used in wash down applications, the unit is IP 65 rated for dust and water. A separate RS-232 and load cell cable connectors lets you isolate the connections for added water safety and an internal rechargeable battery means that you do not need to be attached to power supplies for operation. Easy to use with highlighted tare key for quick recognition and a bright backlit display with large 22mm / 0.86” is easy-toread in any lighting condition. Here you will find the best load cell, all models all brands, are highly efficient and long-lasting products because we reserve the best materials just for you. 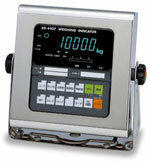 All our Weight Indicator Adam AE 401 are guaranteed. Weight Indicator Adam AE 401 are one of the best on the market this days. What are you waiting for ?